Comrades, Soviets, prisoners – lend me your ears! I come to bury Stalin, not to praise him! Stalin’s death on March 5th, 1953, brought about the new regime of Nikita Khrushchev, one of the heads of the Soviet Union. 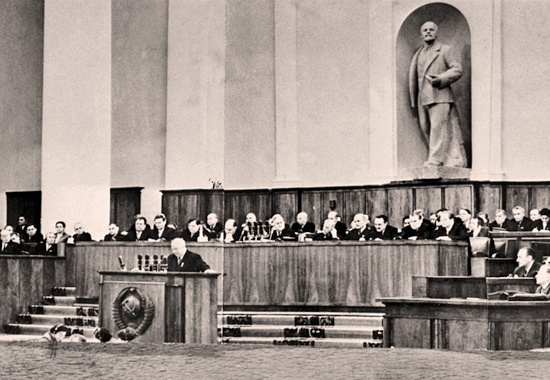 During the Twentieth Party Congress on February 25th 1956, Khrushchev, in bold manner, closed all doors of the Congress to the public and delivered his famous “Secret Speech,” which wouldn’t be so secret after all preceding several games of telephone. His words served as a first for the Russian people, speaking publicly, or in front of a large body of party members, of Stalin’s crimes, including: “arrests, deportations [to Siberia], and executions of Soviet Citizens.” Not only did the new head drag Stalin’s treatment of the people through the mud, but he also denounced his leadership during wartime, his use of “cult of personality,” and believed Stalin to be the downfall of Soviet agriculture (RR 540). Khrushchev is said to have initiated the “Thaw,” or the de-Stalinization of the USSR with his not-so-Secret Speech. The scientific hub was created in 1957 by the man himself, Nikita Khrushchev, who approved of a space specifically for scientists and students in the field to conduct their research free of distractions. Akademgorodok was built deep in the Siberian forest, 30 kilometers away from the nearest city, Novosibirsk, plenty isolated from the rest of the USSR. It originally was “built as a woodland campus for Novosibirsk State University along with 15 institutes for the Soviet Academy of Sciences,” offering courses from nuclear physics to geology, building a bridge between research and education. This appeal to scientific advancement within the motherland that was previously repressed brought about around 65,000 scientists along with their families at most. The Soviet Silicon Valley has even found its way into a Guinness World Records for having the “The Brainiest Street in the World,” Academician Lavrentiev Prospect has well over 20 scientific research institutes in only 2.5 kilometers. What made Akademgorodok so special as a scientific and academic space was that it was able to flourish in a way that it certainly could not have during Stalin’s regime, it could be argued that even during Khrushchev’s time it enjoyed certain liberties from being so far away from Moscow’s grasp, being a “modernist cultural centre.” Not only were scientists able to research or experiment on whatever they wanted, but other forms of intellectuals were able to take part in culture that was previously prohibited like read banned books and perform and see theatrical performances. Areas that were once considered pseudoscience (beliefs, theories, or practices that have been or are considered scientific, but have no basis in scientific fact) or “Soviet science” like cybernetics and genetics grew in an unprecedented rate in relation to scientific Soviet advancements. Even now, residents in the hub are physically and mentally separated from Moscow, allowing them to make decisions and determinations purely based on scientific experimentation and research and not on Soviet ideology. Akademgorodok is a perfect example of the “openness of exchange” the occurred with the “Thaw” brought about by Khrushchev. Soviet culture before Stalin’s cultural revolution during the 1930s was effective in watering down love and romance, calling it a “bourgeois nonsense.” Though, the return of more traditional family values and more conservative concepts allowed the return of courting and romance right before the beginnings of The Great Patriotic War. And so emerges the story that we all know very well, between a girl and boy that are separated by the conscripts of war. In their fight, the men were made to defend the motherland and for their lovers, and the women in return kept busy playing their part in the war effort as factory and community leaders, and were even placed at the front. Rampant romance throughout war-time Russia led to a rise in illegitimate births, widows, and an absence of healthy young men to procreate the next generation of soldiers and workers. Though, what did remain from the generation of lovers were the words and sentiments of couples during the Great Patriotic War, which fully conveyed the anxieties and also hopes of one day being reunited. One such writer, Konstantin Simonov, was heavily influenced by the military, both his late father and his stepfather served in the Russian military, the latter would be arrested. After his stepfather’s arrest he began to study literature and showed an interest in poetry; though, his interests in the arts were in vain during Stalin’s Great Purges. In 1939 he was sent to Mongolia in support of the motherland during the Soviet-Japanese campaign, a while after was when he fell in love with actress Valentina Serova, the muse of his most famous poem, “Wait for Me.” When Hitler’s June 1941 invasion occurred, Simonov turned his attention towards his duty as a Soviet citizen by exhibiting patriotism through his pen. A good amount of his poems were dedicated to his lover Valentina, what troubled him was his conflicting devotions and motivations between loving Valentina and his duty as a soldier. As the war went on, Simonov’s work took a turn to a more pessimistic tone, from asking Valentina to wait for him and for their reunion, to his acceptance of Valentina’s eventual affair due to his absence and the real possibility of him being killed in action. While it seems pessimistic, the poet actually saw his acceptance of these truths as “part of the fortunes of war,” and rather exemplified the femininity of women and the comradeship of war. After Russia’s victory, Simonov actually ended up going home to Valentina, but the marriage was ultimately a failure. In 1957 the soldier turned war correspondent left the actress and remarried. Posted on October 28, 2018 November 28, 2018 8 Comments on Shall I Compare Thee to a Russian Winter? Stalin’s Soviet Union used film to capture Russian audiences in the 1930s and to further their agenda of cultural revolution. Cinema served as the most efficient and gleaming tool for the masses, it was the easiest and most ‘entertaining’ way to hold the attention of the Russian people in a way that socialist realist literature could not achieve. 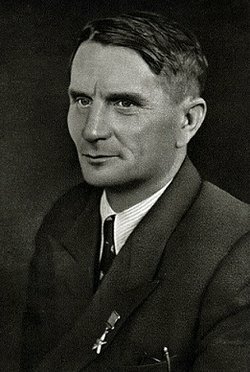 Stalin created specialized departments behind the idea of cultural revolution for the most important centers of media which included film and literature, the head of film was Boris Shumiatskii. In the wake of bringing soviet culture back to the proletariat (compared to the ‘weird aesthetics’ of the old intelligencia and the other pre-revolutionary thinkers), Shumiatskii wished to make cinema more entertaining and enjoyable for his audiences but also wished for it to be able to spread the Soviet 1930s agenda. The aim of 1930s popular culture was to still keep a rigid stencil of what Stalin wanted Soviet Russia to be, but to bring it more back to ‘tradition’ and back to the simple proletarian thinker. Just like the RAPP (Russian Association of Proletarian Writers) and Union of Soviet Writers, the cinema community was centralized within its own union, which imposed its own agenda based on Stalin’s wishes and were strict on what films it would support and approve. Blockbusters of their time, Happy-Go-Lucky Fellows and Chapaev followed the guidelines of uplifting Soviet rule and being able to hold the attention of audiences. Chapaev in particular, focused on the different facets within the Civil War between the tsarist Whites and the Soviet Reds; with Chapaev as the infamous commander of a diverse band of revolutionary fighters. The film was based off of the novel written by Dimitrii Furmanov who was a Russian military officer during World War II and during the revolutions 1917. Interestingly, the glorified fighter he based his novel off of was also the same man that his wife had an affair with, the irony. Now Furmanov’s most famous novel about his wife’s lover will be forever remembered as a lively story about the “rough-cut” commander Chapaev, which made the film adaption one of Russia’s first blockbusters. The original film poster for Chapaev that was released during 1934 and was influenced by Stalin’s 1930s cultural revolution. Chapaev struck its audience so deeply that when children would play a game called ‘Reds vs. Whites,’ the most popular soldier to play would be none other than Chapaev. The politics involved in Chapaev surrounded the Russian Commander and his subordinate Kylchkov. According to Furmanov, Chapaev was the brawn of the Civil War, a celebrated and dignified war hero, but also not particularly ideologically inclined to Soviet thought, though possessed revolutionary sensibilities. The other side of the same coin, Klychkov, served as the political brains of the operation, one of his duties as a member of Chapaev’s band was it point him in the right ideological direction; his greatest asset was his hold on the politics behind the party. Chapaev represented the mobilized peasants of the revolution and Kylchkov as the informed working proletariat. Both are equally important in order to bring forth revolution, which could be seen as the beauty behind the brains and the brawn. Posted on September 14, 2018 November 28, 2018 8 Comments on Is this the Dziga you’re looking for? Lady MacBeth of Mtsensk? Bad Romance. Lady MacBeth of Mtsensk is a novella by the Russian novelist, Nikolai Leskov, that was published in 1865. Before his writing career, he traveled all over Russia as a clerk for a criminal court and got to experience contemporary Russian life, his travels allowed him to meet Russian people of different customs, ethnicities, and regions. 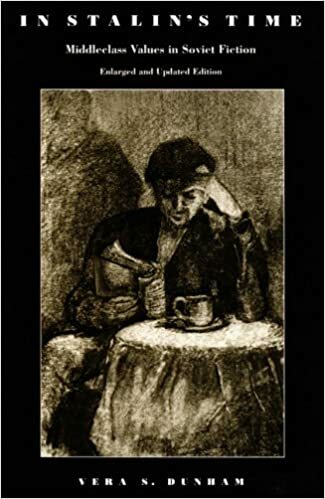 This perspective on Russian society is what set him apart from other writers during his time, his published works would later be so controversial (against traditional Russian Orthodoxy) that they would be banned by the church. The novella is set during 19th century in Mtsensk, Russia, and revolves around the life of Katerina Lovovna, the wife of the merchant Zinovy Borisych. Pretty much reflective of the life of a ‘higher’ class Russian woman of the 19th century, Katerina lounges around her house and is subject to extreme boredom, especially since it is revealed that Katerina is infertile and cannot bare a child. The real story begins when Zinovy, the merchant husband, momentarily leaves the household to deal a mill that has broken down out of town, Katerina takes this as an opportunity to strike up an affair when her husband’s new clerk, Sergei, who has a prominent reputation for being a womanizer. Long story short, Katerina falls deeply in love with Sergei, to the point where she is willing to kill her father in law, Boris Izmailov, who hears about his daughter in law’s affair, and she is also willing to kill her husband himself when he unexpectedly returns. The couple then murders a nephew of Boris, when it is revealed that the boy would inherit a fortune from his death; unlucky for both Katerina and Sergei, the suspicious townspeople peek through a window and find them smothering the boy with a pillow. Sergei admits to their crimes in court, and both are sent off to walk and work in Siberian camps. If all her misfortune wasn’t enough, Sergei then gets to know multiple women in their work camp, often taunting Katerina, who cannot find it in herself to get over her love for him. At the end, Katerina becomes so overwhelmed with Sergei and his girlfriend’s low jabs at her being worthless and undesirable that she drowns herself with Sergei’s girlfriend in her arms. The aspects that drove the story were the boundaries on Katerina’s life and the expectations that people had of her as the wife of a Russian merchant in the 19th century. (1) The inability and lack of freedom she had as a woman of class exposed her to absolute boredom, boredom that she hadn’t experienced before as a free peasant maiden. Being a woman of class allowed her to: stay at home, eat, and sleep. (2) One thing that could’ve saved her from boredom, and something that she was expected to do for her husband, was have and take care for a child. She couldn’t even do this because she was infertile, and in this way she was completely useless to her husband since she couldn’t provide him an heir. (3) Not to mention, the arranged marriage with her husband, that was meant to get her out of rags, was devoid of love, which was acknowledged right before Katerina and Sergei killed Zinovy. This loveless marriage and life of boredom is most certainly a factor in why she got involved with the handsome Sergei. (4) Katerina by just being a merchant’s wife got herself into trouble, throughout the novella Sergei loves mentioning how she is a merchant’s wife. The class and wealth coming with a merchant status definitely attracted Sergei, this is even more evident after the couple is sent to Siberia, when Katerina is nothing but a prisoner Sergei is no longer interested in her. If Katerina was put in an entirely different context, a different time and a different place, the novel wouldn’t be the novel that Leskov intended to write about Russian culture and society. Posted on September 3, 2018 November 28, 2018 5 Comments on Lady MacBeth of Mtsensk? Bad Romance.